The Golden Jubilee Regatta saw the best turnout for a number of years with 52 boats entering, 22 of which were Coniston boats. Five races were held over 2 days with a long-distance race on the Bank Holiday Monday. I14 - Another Europeans Win! After Glen Truswell took a break in 2017 having won every Int 14 event possible including 2 world championships - Lennon sails / Racewear partnered with Neale Jones and Ed FitzGerald to continue the development work in both sails and Racewear in this most demanding class. 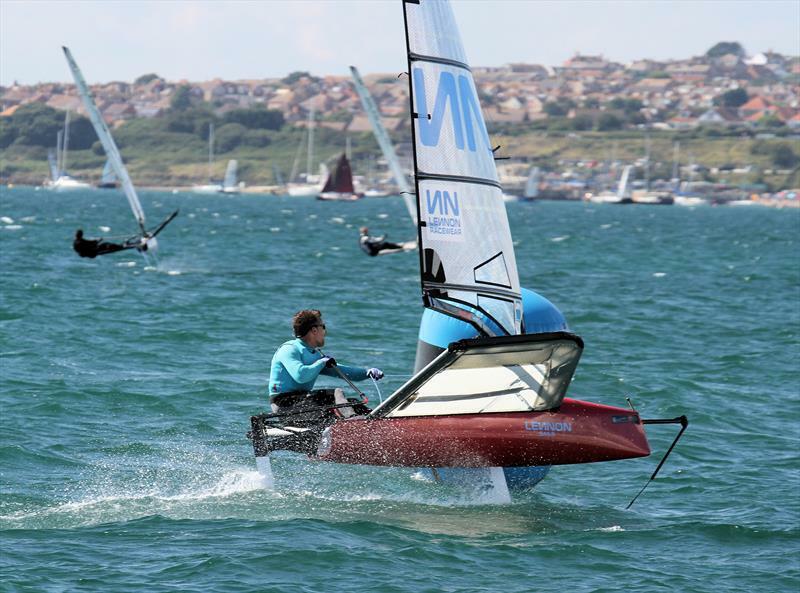 Light and Shifty winds dominate day 2 of the IMCA UK Moth Nationals at Paignton SC. Thinnair hull #1 was first shown at the RYA dinghy show in early March - since then we have been destruction testing the hull and compiling the list of modifications for the boat we will take to the Moth Worlds later this year. In Early 2015 Mike Lennon of Lennon Performance Products (Lennon sails and Racewear) was approached by David Hollom to help him develop some foils for the Moth. At that time Mike felt unable to help due to other commitments. Lennon ambassador, Dylan Fletcher podiums in fiercely contested final day. Lennon Racewear recently supported Filey SC 65th Anniversary Regatta. Based on the beautiful North Yorkshire coast. The event attracts local sailing clubs and has a variety of entires including Cats and dinghies. Mike Lennon wins Moth Euros. Dylan Fletcher, Racewear Ambassador makes Rio. adding the Europeans to their collection. Lennon Sails will again support the Moth Euros in Holland this year. Another fantastic result for Lennon Sail last weekend in a rough and tumble weekend of weather. With 8 races down its tight at the top. Congratulation to Dylan on taking the Moth Inlands over the weekend at Grafham. Glen and Sam's clean sweep at Castle Cove. Ricky Tagg took this years Torbay GP win. Clive Everest secures Cherub National win with resounding victory at Weston Sailing Club. Club Sailors are enjoying success with their new Lennon Laser Training Sail. International Moth World Championships at Hayling Island. Chris Rashley takes 2nd in Moth Worlds while Lennon also have two more in top ten with Dylan Fletcher and Moth sail designer and co-owner of Lennon Sails, Mike Lennon. "Only won today with the new sail! Nice shape, good pointing. Happy bunny!" Four Lennon International Moth sails were delivered in April to German customers. Lennon sails takes Stokes Bay dealing with a light and shifty weekend. Lennon Sails ambassador, Chris Rashley wins Delta Lloyd Regatta. Since its formation earlier this year Lennon sails has been delivering sails into the Moth fleet both into the UK and the rest of the world. Racing at Weymouth would the first test. Weymouth Open - part of the UK Grand Prix series was held over the weekend of the 17th / 18 th May.